I haven’t yet tried out this 51, whose barrel markings have been effaced (though the imprinted name ‘Annette Jenkins’ stands out sharply and clearly. 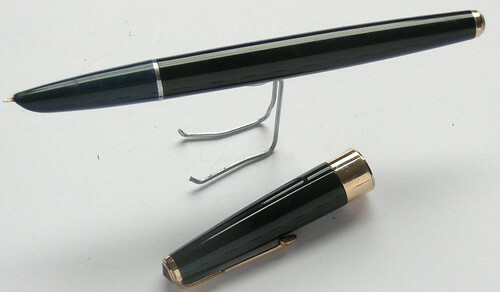 This pen is black, with the Lustraloy cap. Finally, here’s a special 51 about which I have somewhat mixed feelings. Its barrel is forest green (more easily confirmed when you put it side-by-side with the black one), with a chrome cap. The barrel imprint suggests that it’s from the second quarter of the spring of 1952, made in England. It’s an oblique italic nib; I hadn’t even known Parker made 51s with oblique italic nibs, and my friend Peter has been trying to inveigle me into letting him have it. I love a nice stub italic nib, but after one fill of the oblique nib I’m having trouble getting the wrist angle right. I’m not sure I’ll keep this one, but it’ll come dear for whoever gets it, since I sense something of a rarity. I’ve had some Parker 45s for a while: one Flighter (all brushed metal body), one olive green barrel (ah, the 60’s) with a chrome cap, and one blue plastic model. 45s don’t have hooded nibs, exactly, but you can see that they’re cousins to the 51. They’re nice pens, not as upscale as the 51, but good sturdy writers. Another relative of the 51 — less ambitious, but closer genetically — is the hooded-nib Parker 21, of which I also have several — two chrome-and-red, one chrome-and-green, and a chrome-and-black with its original sales tag (and, alas, a very visible crack in the barrel). The red 21 with ‘Louis Savoie’ imprinted on the barrel is a dream to write with, one of my very favourites (thank you, Louis). Two more types. The first is the Parker 17, a model with which I’d been unfamiliar until I came over to Scotland. Apparently they were a popular choice as school pens a few generations ago, and they pop up pretty regularly at car boot sales and antique shops. I have three — one black full size, and two smaller ‘Lady’ sizes in blue and red. The plastic feels light, but they seem to be good writers (I haven’t given them thorough workouts at this point). To be exact, the full size 17 seems to be black-and-blue — if you look closely at the section (the bit nearest the nib) and compare it to the barrel, you can see the difference. Someone evidently confused one pen portion for another, or fixed a broken section on the black 17 by replacing it with an intact blue section. Whatever. Last year, at a point when I wanted to treat myself, I bought a rather special Parker 61 Flighter from Peter Crook. 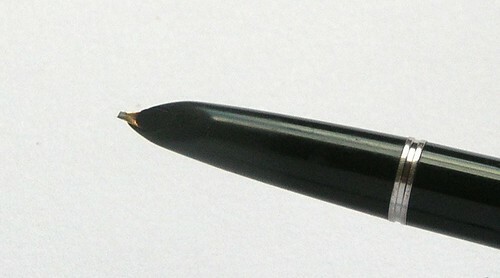 The Parker 61 was originally made with a unique capillary-filling system — just unscrew the barrel, immerse the point capillary cell in ink for a few seconds, and the capillary action would draw up the ink and fill itself — but over the long haul, the capillary system proved fiddly, was wont to dry out and either clog or just go on strike, and eventually Parker changed the model over to a cartridge/converter filler. Peter had removed a balky capillary fill system from this 61, and replaced it himself with a converter. This one also lacks the trademark silver arrow just above the nib, alas; you can see aslight dimpled indentation where the arrow would go. If you have a spare silver arrow lying about that you would be willing to part with, please let me know. Finally, I have a couple of UK Parker Duofolds. Parker has used the Duofold name for a variety of pen models, but these belong to the branch of the family that represents durable everyday office pens; I see a fair number of these at shops and shows, too. One of the nice touches on these models is the cap band, wider on the black Duofold Junior, wider on the grey AF (‘Aluminium Feed’) model. That’s it for my Parkers. I’ve come across these mostly as unanticipated bargains (I think the 61 and one of the 51s are the only ones I paid a reasonable price for); I don’t think of myself as deliberately collecting Parkers, as many of my pen colleagues do. It does seem as though I have a lot, though, when I look at them together like this. For the next time I conduct a pen shoot, I’ve learned some lessons about focus, depth of field, and camera position. We’ll see if I remember them. These are beautiful, AKMA. I’ve been married for nearly 30 years to a dedicated fountain pen man, but have yet to find one that suits my being a lefty. Or maybe I just need to be a little more patient with myself. At any rate, I’m a fan of anyone who encourages actual handwriting with really classy implements such as these! Thank you for curating this collection! I belong to one of the last generations of US public school pupils to use pen and ink in the classroom: Shaeffer provided the glass bottles of washable blue ink, and–while there were many pens available, Parker pens were very much on the list of those to use. I get a nostalgic rush thinking about those glass ink bottles with the interior ink wells that made filling a fountain pen easy. The shift to ink cartridges took the magic away, and of course the shift to ball-points made every pen a Bic. As a child, maybe in fifth grade, my class boarded the school bus and headed off from Madison to Janesville for a tour of the Parker pen company. This was the Parker company’s mother-ship facility… where it all began. I don’t remember much about the tour except for our glimpse of the gold that the company had stored for manufacturing their more upscale models. I received one of those as a gift in the fifties and lost track of it before I had graduated from high school. Maybe you’ll run across it at a garage sale or something. It had a gold point and a black barrel. You’ll recognize it. Some people say vintage are the best. Well, in term of flex nib I must agree to that. In my personal opinion, I love both vintage and modern fountain pen a alike. Modern fountain pen, especially with clear barrel caught my attention very fast. I hope to collect a lot of them.